For the 2018 season Toyota has upgraded its Prado range, with a facelift and tail tuck, a revised interior and additional infotainment and safety technology. Our test vehicle was the LandCruiser Prado toplne model, the Kakadu. Not cheap at $84,490 but do you get a substantial amount of vehicle for your money. And the price has been trimmed by $1121 compared to the model it has just superseded. The new grille is big and bold with broad vertical bars flanked by restyled headlamps (bi-LED on GXL, VX and our test Kakadu). The main beams have been positioned slightly further inboard to reduce the chances of damage when off-road driving. At the rear, there are new lamp clusters and a smaller garnish incorporated within the number-plate surround. The bonnet is now sculpted in the centre to enhance downward visibility, which is particularly useful in serious off-road driving. The front guards have been re-profiled and the lower corners of the front and rear bumpers now kick upwards, again to enhance off-road running. 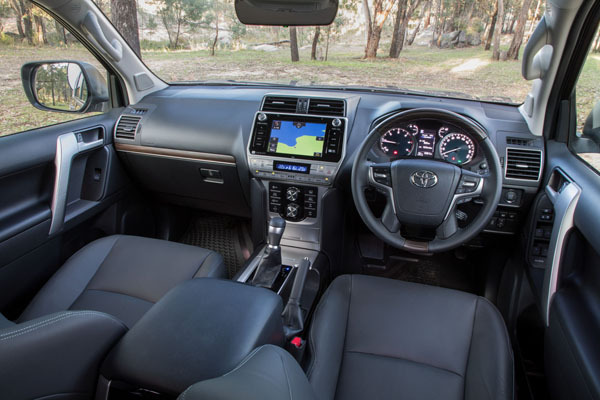 Inside, LandCruiser Prado has a redesigned dashboard, instrument binnacle and switches. The centre console now incorporates a flush-surface air-conditioning control panel. The sound system has decent quality and is easy to control through the 8.0-inch touchscreen. It loses FM radio too early for our liking – after all this is a vehicle designed to go big distances and well away from civilisation and it’s nice to have decent entertainment. AM works fine, it’s just that the sound quality isn’t there. Apple CarPlay and Android Auto are sadly lacking, but there is Bluetooth connectivity. Ah, well … looks you will have to sit around the campfire and tell tall tales and do your own singing. All Prados now use the 2.8-litre turbo-diesel as sales of the petrol unit in the previous models were minimal. The diesel has an electronically controlled common-rail direct-injection system that develops 130 kW at just 3400 rpm. There’s 450 Nm of torque between 1600 and 2400 rpm when sitting in front of a six-speed automatic transmission. When mated to a six-speed manual transmission, only offered on Prado GX or GXL, the engine is tuned slightly differently and develops peak torque of 420 Nm from 1400 to 2600 rpm. 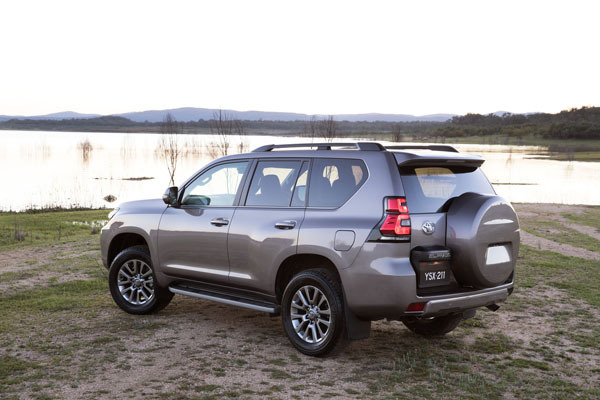 Advanced safety features now standard on all LandCruiser Prado automatic models are pre-collision safety system (PCS) with autonomous emergency braking and pedestrian detection, active cruise control (ACC), lane departure alert and auto high beam. PCS and ACC were previously exclusive to the topline Kakadu. The pre-collision safety system can now detect impact risks with pedestrians as well as vehicles. This is a real 4WD so getting in and out can be a bit of a climb / drop for some people due to the high ground clearance. Kids will love it, but grandparents who are getting on in years should be taken along on your pre-purchase test drive. This is a large vehicle that can be a handful in tight carparks, but on the road – and off it – the big Toyota is smooth, quiet and very comfortable. It really does feel almost limo like in that spacious cabin. All-round visibility is pretty good, but there were certainly times when we appreciated having the beeps and cameras to help us when in close company with concrete pillars. Engine performance from the turbo-diesel is good without being exciting. There’s no real turbo lag and the fact that the engine is already at its torque peak by 1600 revs means it lopes along with ease, climbs hills without breathing hard and can carry a load of people and luggage without the driver noticing any significant difference. Fuel consumption was in the eight to nine litres per hundred kilometre range on motorways and country cruising. Around town it’s more likely to be in the ten to fifteen litre range depending on traffic and your driving style. Off-road? It has twin fuel tanks totalling 150 litres so you can go long distances when the spirit of adventure strikes you and the family. Handling is competent with plenty of road grip, but this is as far from being a sports SUV as any you’ill find on the market. Which probably suits approximately 100 per cent of potential buyers. Overall the looks of the latest Prado really impress us. It’s no longer a practical 4WD station wagon, it now has the sort of style that competes with the flood of large SUVs on the market. 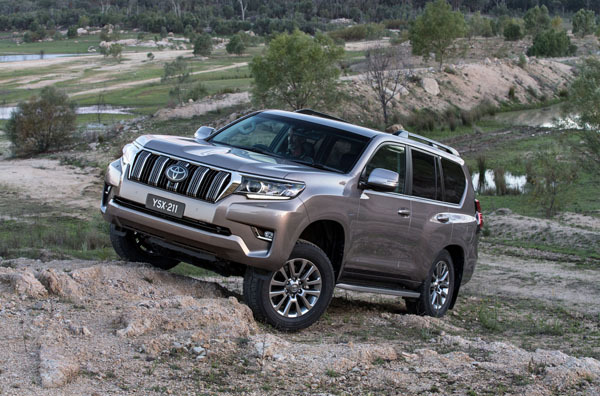 Note that we differentiate between 4WDs, which the LandCruiser Prado certainly is, and the majority of other vehicles that are SUVs.